Spiritual Abuse (spir'-i-choo-el a-byoos'). Wouldn't it be great if it was as simple as looking it up in a dictionary? But nothing about spiritual abuse is simple. Those who have experienced it, know it is powerful enough to cause them to question their relationship with God, indeed, the very existence of God. And it is subtle too! The perpetrators of spiritual abuse are rarely 'Snidely Whiplash' sorts of characters who announce that they are going to drain your spiritual energy. They may be people who seem like they are seeking to guide you to the deepest levels of spiritual maturity. The result? 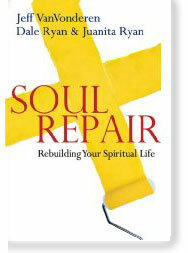 Well, if you have experienced spiritual abuse, you know result. We hope the resources at this web site will be helpful to you. The damage that has been done is not irreversible. It is possible to feel safe again. It is possible to learn to rest again. It is possible to regain that sense of blessing you once had when you first realized that God's stance towards you, God's 'yes', was not based on your performance, but rather on God's very own performance, that of Jesus, signed, sealed, finished, available in gift-form only.